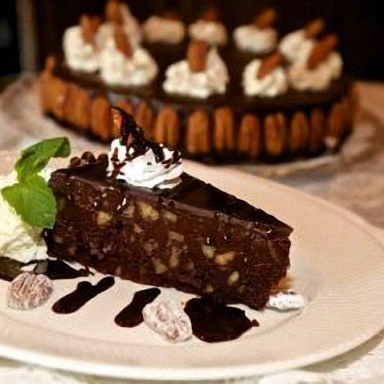 Karen's Chocolate Bourbon Pecan Cake is on the menu at Café at Adele's... This chocolate cake is made without flour and is lighter than most flourless cakes and less sweet. However, the intensely chocolate flavor is beyond compare. Make the cake a day ahead to allow for chilling before glazing. Spread pecans on baking sheet and lightly toast in 350-degree oven, approximately 15 minutes. Once cooled, chop finely and set aside 1/2 cup that will be used as garnish. In a double boiler, melt 8 ounces butter (cut into 12 pieces) and 8 ounces chocolate (also cut into small pieces) together. Add cocoa, smoothing until there are no lumps. Remove from heat and add sugar, eggs and bourbon, mixing well. Once mixed, gently fold in 1 1/2 cups pecans. Butter the sides and line the bottom of 9-inch round pan with parchment. Pour mixture into pan. Place this pan into a larger pan, adding 1/2 inch of hot water. Bake in water bath at 350 degrees for about 50 minutes. It's OK if the surface cracks a bit. Remove from oven and allow to cool, leaving in the pan. Chill overnight or freeze to unmold. In a double boiler, melt the chocolate and butter, adding the butter a tablespoon at a time, and whisk to smooth. Each piece should be partially melted before adding the next. If the mixture starts to thin out after adding half the butter, remove it from heat and continue adding the rest of the butter. Make sure butter is thoroughly mixed and leaves no streaks. The glaze should be thick enough to set rather quickly, but if it's too thick, it will be difficult to spread a thin layer. To test consistency, hold a teaspoon of glaze above the pan, letting it drip back in. The glaze should be visible about two seconds before disappearing into the rest of the glaze. If necessary, let the glaze cool to thicken or heat gently to thin. Drizzle spoonfuls of glaze along the edges of the cake so glaze drips down and coats the sides. When the sides are completely covered, spoon the rest of the glaze over the top of the cake and if needed, smooth with a flexible metal spatula. Cover the sides of the cake with the remaining 1/2 cup of pecans, pressing them gently against the glaze with the palm of your hand. 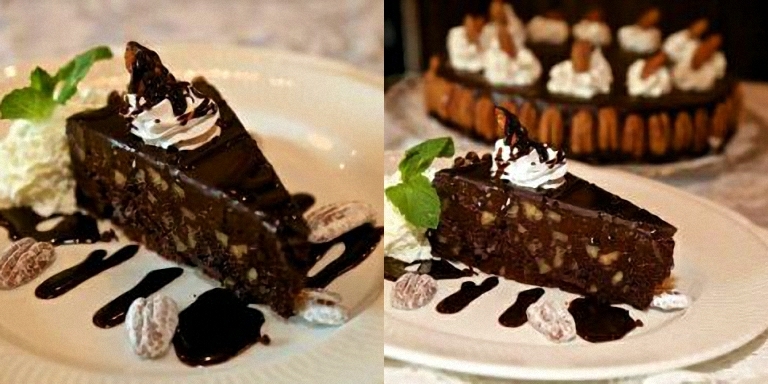 This chocolate cake is made without flour and is lighter than most flourless cakes and less sweet. However, the intensely chocolate flavor is beyond compare. Make the cake a day ahead to allow for chilling before glazing.